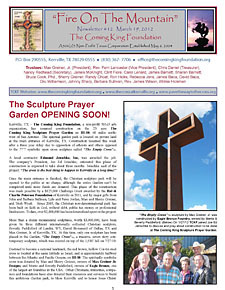 The Coming King Foundation is now holding scheduled events at The Coming King Sculpture Prayer Garden in Kerrville, TX. Most of these activities are open and free to the public. 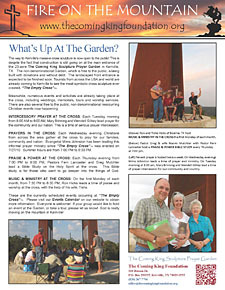 These events, which are held near "The Empty Cross" at the top of the 1930' hill include tours, speakers, music, prayer, and teaching activities. In addition, private memorials and weddings are also being held at the foot of the 77'7" Resurrection cross. Christian churches and ministries are invited to use this wonderful resource in our community. 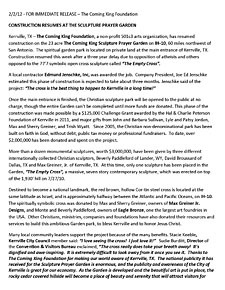 Please be aware that even though the massive $2,000,000 open cross sculpture has been erected, the remainder of the 23 spiritual Garden cannot be finished until more funds are donated. Over $3,000,000 worth of Christ-honoring monumental sculptures have already been donated to the Garden by three internationally collected artists. But this art cannot be placed until the roads, parking lots and side gardens are built. 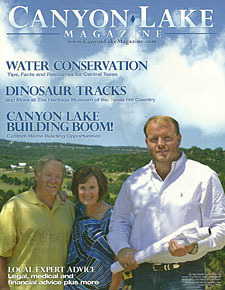 This beautiful, "free to the public" Garden is being built on faith in God without debt or professional fundraisers. Over $2,000,000 has already been spent on the Garden to date. However, the road to the cross from Benson Dr. is open now. If you, your group or your organization would like to schedule a tour or function at the Garden, please contact the TCKF office. There are two categories of functions held at the 23 acre Christian Garden: "Sanctioned" and "Sponsored". Sponsored events are planned and hosted by The Coming King Foundation. Sanctioned events are allowed by TCKF but are planned and hosted by others. Please understand that this private Garden has been created to bless our community and to bring honor, glory and people to Jesus Christ. Therefore, NO events or activities will be allowed that lift up other gods. People from all backgrounds, races and religions are welcome at the foot of the cross. However, only the one true God will be honored on this holy land. This is the God of the Bible: Father, Son and Holy Spirit. Non-religious, secular groups, clubs and schools are welcome to use and tour the Garden, which is open 7 days a week, from 6:00 AM until Midnight. Finally, the Kerrville Police Department and the Kerr County Sheriff's Office patrol the Garden at our request. Be aware that security cameras have also been placed around the Garden. Please report any suspicious activities to TCKF or the police. Thank you for your prayers and support. We hope you enjoy your visit to The Coming King Sculpture Garden!